When the waitress finally came to our table bearing a piece of one of the most famous chocolate cakes in the world, I was excited with a little trepidation. I had read so much about it and even heard there were great arguments over just who had first invented this source of Vienna pride. Could it possibly live up to all of its hype? After slowly cutting the first bite, I soon realized that I hadn’t quite prepared myself for the flood of chocolate happiness that threatened to overwhelm my taste buds. This very moist, very dense, very filling cake more than lived up to all its publicity. The Sacher-Torte really is a rock star. I was recently sent to Vienna, Austria to cover a conference for my other job as a medical journalist. Although that kept me very busy, I was determined to eek out some time with my Mom, who had come along, to go exploring this architecturally fascinating and very pretty city. 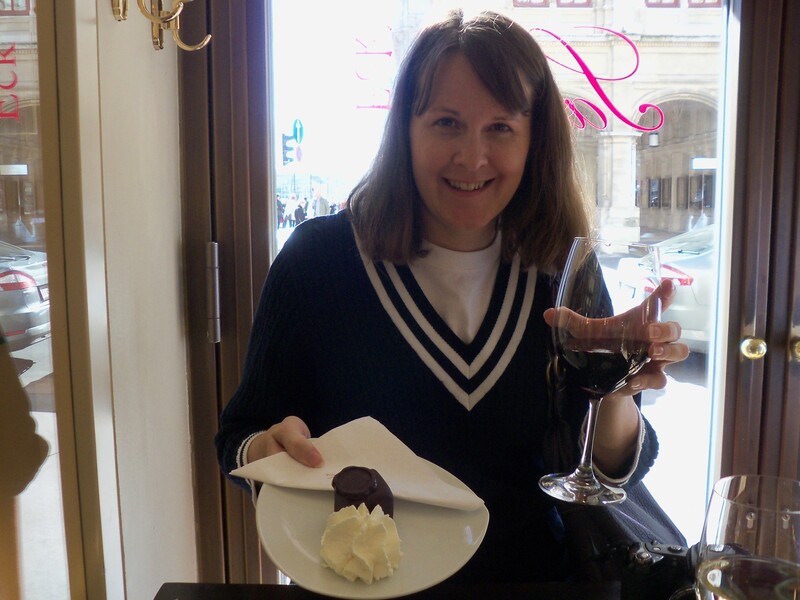 In addition to checking out old palaces, museums, and even their giant ferris wheel, my list also included tasting a Viennese Sacher-Torte for myself. 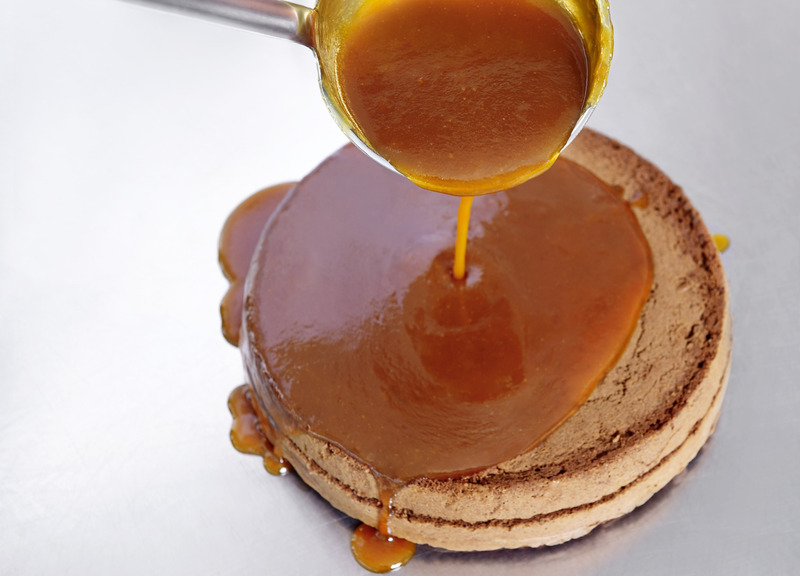 According to several sources, this official torte was invented in 1832 by then 16-year-old apprentice chef Franz Sacher for Prince Wenzel von Metternich of Vienna, although similar recipes were said to have been around since the 1700s. 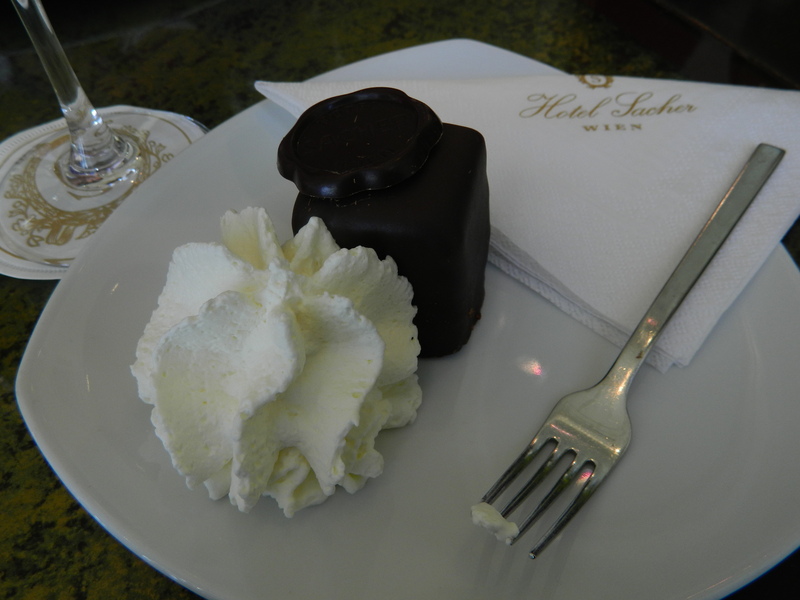 It was first served publicly at the Demel and then at the Hotel Sacher, which was opened by Sacher’s oldest son Eduard. The phrase “the original Sacher-Torte” went on to become part of a legal battle between the Demel bakery and the Hotel Sacher. You see, Eduard changed (some say perfected) his father’s recipe while working at the Demel bakery. 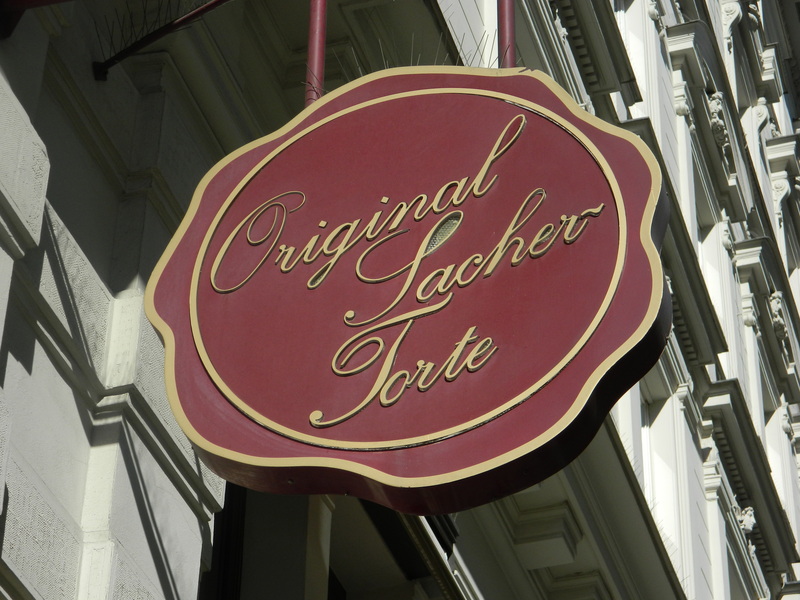 The final out-of-court settlement in the 1960s ended with the Hotel Sacher owning the rights to “the original Sacher-Torte” and the Demel being able to use “Eduard-Sacher-Torte.” Both companies still sell their very popular versions. The Hotel Sacher’s sign, hung with pride. 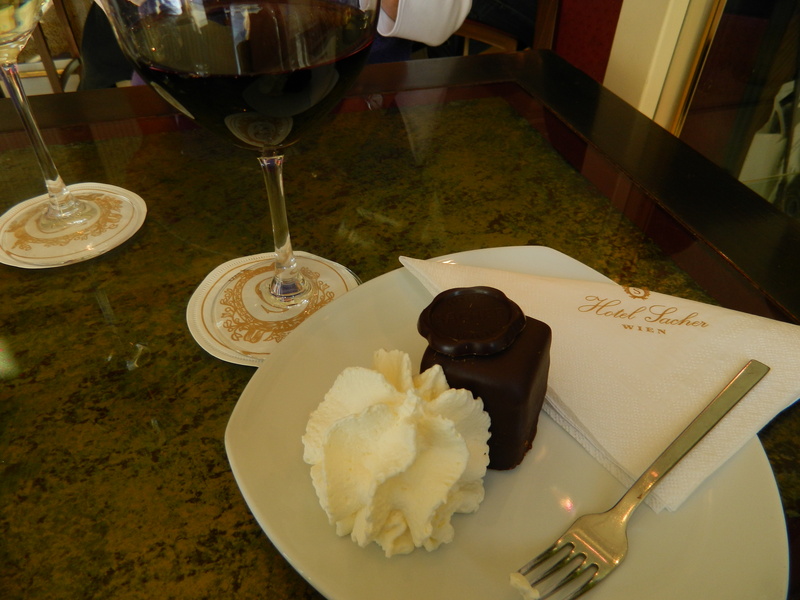 One cool afternoon, we decided to try the Hotel Sacher’s version. 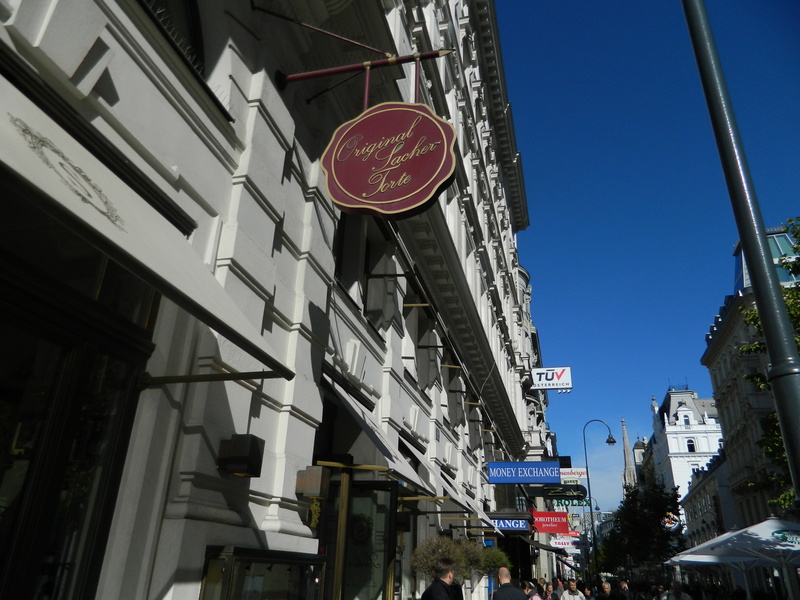 Located just across from the Opera House in the center of the city, we stepped into the Café Sacher and were quickly seated at a cozy high table beside its side windows. We ordered glasses of red wine (what better to go with chocolate??) and were given the option of ordering full slices of the torte for each of us, getting 1 slice to share, or ordering a mini-sampler for each. After seeing just how big the slices were, we opted for the mini versions, which when served looked a bit like a squared Hostess Ding-Dong! My serving, right before I dove in! “The Original Sacher-Torte” is a rich, dark chocolate cake with a thin layer of apricot jam and then iced with what is rumored to be a mixture of 3 types of high quality chocolate. And it’s served with a healthy dollop of unsweetened whipped cream and a round chocolate seal bearing the hotel’s name. I never really tasted the jam, but I’d guess that that’s what gives the normally somewhat bitter dark chocolate its sweetness. The whole thing was fantastic but very filling. The smaller size was definitely the smart option for us! 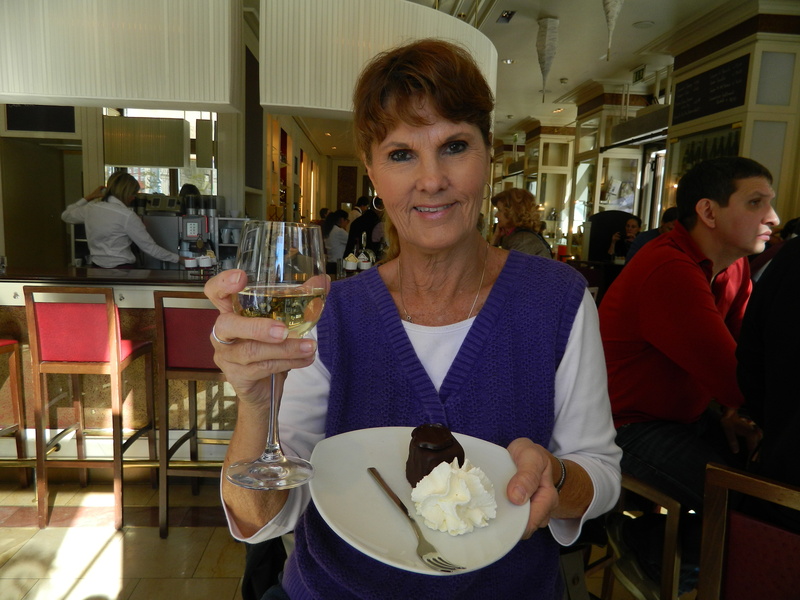 Me with my Sacher-Torte. Yum! My mom – ready to dig in! For anyone who would like to try this historical icon for themselves, the Hotel will ship to anywhere in the world. Just click this link to order online. Just remembering this wonderful bit of chocolate Heaven has me thinking seriously about ordering one for myself! 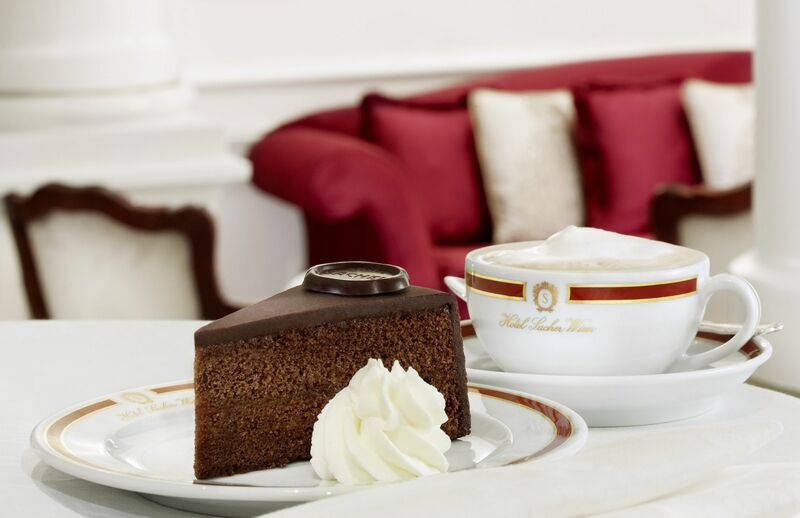 The Hotel Sacher will ship their tortes anywhere in the world after an order is given online. What an interesting story about such a delicious dessert. I have had the opportunity to sample this bit of chocolate heaven and it truly does live up to hype about it.